Ruland Manufacturing Co., Inc. has expanded its line of shaft collars to include double wide versions. The shaft collars, which can also be used as a compact rigid coupling, are offered in one-piece or two-piece clamp styles from high strength aluminium, lead-free black oxide carbon steel, and stainless steel. Available bores range from 3mm (1/8”) to 25mm (1”). Double wide shaft collars are able to sustain higher axial and torsional loads than standard versions because they have additional cap screws to apply pressure to the shaft, and due to the greater shaft surface contact afforded by their extended length. This makes the double wide shaft collars particularly suitable as mechanical stops or on split hubs, when a single collar does not provide sufficient strength. All Ruland shaft collars are single point faced to ensure perpendicularity and proper alignment. Ruland uses forged socket hardware in all its shaft collars. This allows for higher screw torque resulting in increased holding power. Ruland has designed its double wide shaft collars with a cross cut, so as to facilitate their use as a compact rigid coupling. The cross cut enhances the holding power of the coupling, when there is a small variation in shaft size due to tolerances. In general, rigid couplings are suitable when no misalignment is present, and when high torsional strength, zero backlash and maintained alignment are desired. The compact design of these double wide collars reduces inertia, an important consideration in motion control applications, and also makes them ideal when space is limited. Ruland shaft collars and couplings are RoHS compliant. For easy identification, the shaft collars and couplings are stamped with the Ruland name and bore size. Ruland maintains a large inventory and many items are stocked and available for immediate delivery. Double wide shaft collars are part of Ruland’s complete product line, which also includes standard shaft collars, rigid couplings with precision honed bores and five types of zero-backlash motion control couplings: beam couplings, bellows couplings, oldham couplings, miniature disc couplings and curved jaw couplings. 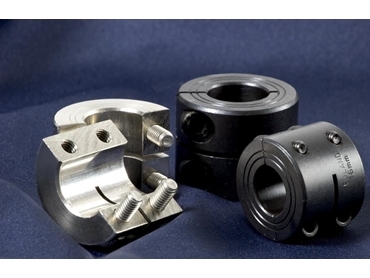 Ruland’s double wide shaft collars are available from Naismith Engineering .